Essex has been awarded a “game-changing” National Lottery grant of £10.68 million from Sport England to increase activity levels across Essex. The three-year plan, published today, promises to tackle the inequalities which prevent 391,600 people in Essex from enjoying the physical, social and mental health benefits of an active lifestyle. Currently, one in four (27%) Essex residents are inactive and carry out less than 30 minutes of physical exercise each week, while people on low incomes are twice as likely to lead sedentary lifestyles (source, Active Lives Survey 2016/17).Getting families, the elderly and people with poor mental health more active is the priority. The successful bid was made by the Essex Local Delivery Pilot (Essex LDP), which is led by the Essex Health and Wellbeing Board, Active Essex, and more than 20 partners including public, community and voluntary sector organisations. Essex is one of 12 pilot areas selected by Sport England, with around £100 million of National Lottery funding being invested in the pilots over the next 3 years to build healthier, more active communities. It is accepted that previous approaches to tackling stubborn inactivity have had mixed results and not been sustainable, so the Essex plan focuses on doing things differently and challenging the root causes of inactivity. In 2018 Essex undertook extensive research to understand what needs to change to help people live more active lives. The findings led to the development of seven strategic priorities and the plan which Sport England has approved, awarding Essex one of its biggest ever National Lottery grants. Public sector organisations in Essex are fully committed to bring about whole system change across health, education, housing, transport and the built environment, tackling the root causes of issues so people can live and work in places which enable them to be physically active - for example cleaning up and improving poorly lit outdoor spaces so they appeal to families or older people. As part of the project, Essex will share their learning and add to the knowledge base nationally and internationally, of what gets in the way of being active and how community groups, public and voluntary partners can help build relevant activity into people’s daily living. Basildon, Colchester and Tendring have been chosen as the initial focus for the Essex pilot as each of these has areas where there are high levels of inactivity and associated health inequalities. The pilot will test new ideas and learn quickly, taking successes Essex-wide to supercharge Active Essex’s strategy to get 1 million people active in Essex by 2021. The Essex LDP has a dedicated team working closely with local communities in Basildon, Colchester, and Tendring to understand what support people need. It is already working with a number of community groups and citizens and is looking forward to meeting many more to bring the plans to life. Anyone interested in getting involved should emailELDP@essex.gov.uk or telephone 03330 131620, or register interest on the website at www.activeessex.org/essex-local-delivery-pilot/. Clacton’s Active 4 Life, a physical activity club which holds weekly classes for over 100 older people, is an example of a successful project which could be replicated across Essex as part of the ELDP. Active 4 Life, which holds weekly classes for over 100 older people at Clacton Leisure Centre and is an excellent example of a club which could be replicated in other parts of Essex. Credit and copyright: Active Essex. Basildon’s Sport for Confidence (pictured) has brought health and sport sectors together to tackle inequalities in physical activity participation and is an excellent example of an organisation Essex LDP is learning from. It places health professionals in leisure centres directly alongside sports coaches and leisure centre staff to make adjustments that create accessible and inclusive sport and physical activity opportunities. The total of the National Lottery grant awards for Essex LDP, either awarded or committed in-principle by Sport England, is £10.68 million. In 2018 Essex LDP was awarded an initial grant of £845,542 to undertake the first part of its work which is summarised in the Chapter One Report, ‘Getting Ready for Systems Change’. The additional £9.84m includes a £5.9025m award now with a further £3.9375m in principle which is subject to Essex Local Delivery Pilot’s early delivery, learning and emerging impact. Basildon, Colchester and Tendring will benefit from a share of the National Lottery award and successes will be scaled up county-wide, supercharging Active Essex’s strategy to get 1 million people active in Essex by 2021. The announcement today coincides with the publication of Essex LDP’s Chapter Two Report, ‘Delivering System Change’. 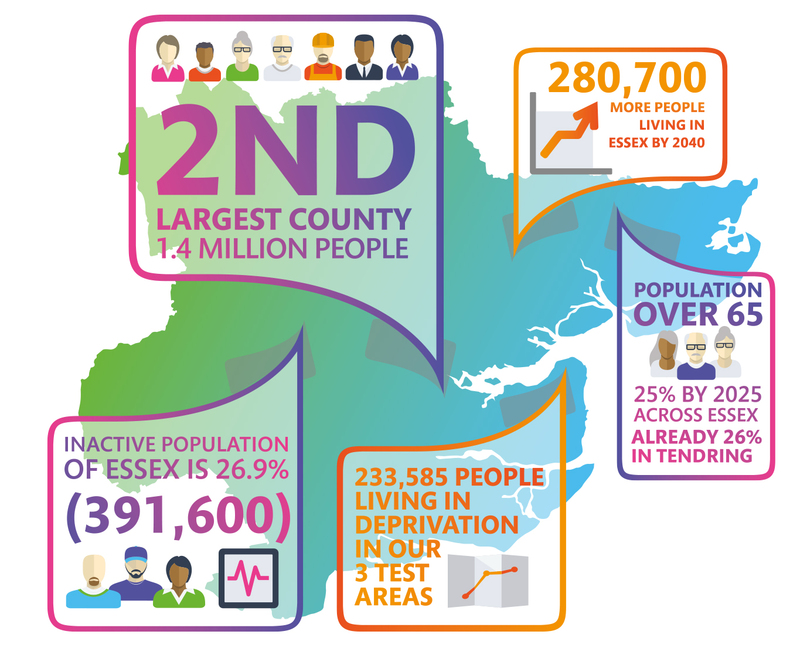 The Essex Local Delivery Pilot (LDP) is a once in a generation opportunity to make a difference for the people of Essex, addressing the high levels of inactivity in our most deprived communities. Essex was chosen by Sport England at the end of 2017 as one of 12 areas in England to undertake this ground-breaking work because of the range of significant problems and opportunities which exist in the county. Increase physical activity, in particular targeting people who currently do under 30 minutes physical activity per week and who live in the most deprived communities. Basildon: A post war 'new town' development with pockets of deprivation and social immobility. Colchester: One of the fastest growing areas in the country which is also seeing a growth in deprivation year on year. The three research projects led to development of seven strategic priorities which are included in the Chapter One report ‘Getting ready for system change’, published in November 2018. The seven strategic priorities have helped shape the Chapter Two delivery plan which will be implemented from 2019 until the end of 2021 with the Sport England National Lottery grant investment. These pilots are deliberately focused on the whole system change - that is the need for strong vision and leadership at the highest level. Collaboration of all stakeholders, at all levels, is key - not just the sporting infrastructure/ projects and interventions. ● Improved outcomes as a result of the above – with proven contributions to some or all of the Government’s outcomes in pilot places. These are physical and mental wellbeing and individual, community and economic benefit. ● Replication of success in other places (extra to the local delivery pilots) because of adoption and implementation of learnings from the local delivery pilots. Replication at scale is very important to Sport England.